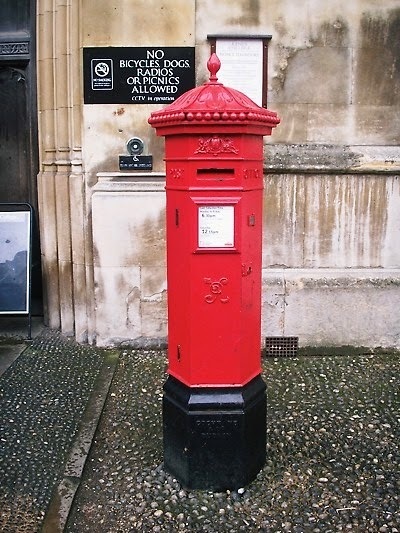 If you were asked to describe the shape of a British post box you would probably describe it as round or cylindrical. There is though one type of post box that is instantly recognisable from Christmas cards to biscuit tins to actual real, functioning letter boxes – the hexagonal Penfold. The Post Office had struggled with a standard design for pillar boxes which could be adopted across the country. 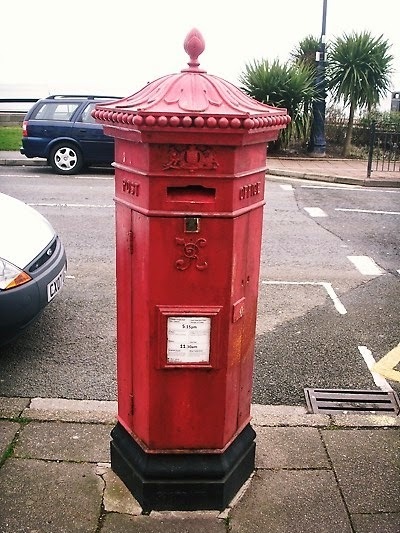 The previous National Standard pillar box introduced in 1859 was lacking in both appearance and functionality. There was no 'Post Office' on the box to indicate whose property it was and no royal cypher. As it made in just one size it was found to be too small for many areas where posting volumes was high. Within five years the Post Office was looking was for yet another design. According to Jean Young Farrugia's book The Letter Box the Secretary to the Post Office, John Tilley, decided it was time for a hexagonal shape. However he noted, “tho' not perhaps remarkably handsome”. Large Penfold in Pembroke Gardens, W8. The second of three Penfolds remaining in Kensington. The third is at Kensington Palace Gardens. In June 1864 the Post Office looked to J(ohn) W(ornham) Penfold to design a new pillar box for them. Penfold was an experienced architect and surveyor. His work as an architect around London and his native Haslemere is often overlooked in favour of his post box design. He was elected the first Honorary Secretary of the Institute of Surveyors (now the Royal Institute of Chartered Surveyors) and also served as President of the Architectural Association. Large Penfold - St. Pancras Way, NW1. Note the textured paint added to the side. By October 1865 the Post Office had finally approved Penfold's new design. As requested it was hexagonal in shape and came complete with 'Post Office' and the Royal Arms crest around its collar and the 'VR' cypher. Whilst it less ornate than previous designs of pillar boxes these were Victorian times and a few flourishes were included. The top of the box was covered in acanthus leaves – a nod to Greek, Roman and Byzantine architecture. These flowed down the roof to a neat row of evenly sized balls. The aperture was covered with a swinging flap with 'LETTERS' on it. Once the design was finalised the contract for making the boxes was awarded to Cochrane, Grove and Company. The new Penfold overcame the problem of high posting volumes by coming in three sizes. Sites for the new post boxes were established and the new boxes started to be distributed in September 1866. Despite their fine appearance the new boxes did have design faults. Complaints about rainwater getting into the box (already a known problem with older boxes) and packages getting stuck in the roof were received. I have seen reports of anything between three and fifteen modifications for the Penfold during its manufacture. The swinging 'LETTERS' flap was the first thing to go. The most significant modification was the lowering of the aperture which switched places with the Royal Arms crest. Despite these problems original boxes are still in use today. I'm not sure if they have been modified internally in any way over the years. Large Penfold - Pavillion Gardens, Buxton, opposite the Opera House. Note the collection plate holder has switched positions with the aperture. When the Penfolds were first made they were painted green as previous boxes had been but the decision was made to start repainting all post boxes red in July 1874. Large Penfold - Promenade Street/Clonmel Street, Llandudno. Same later modification as the Buxton box. The biggest design problem the Penfold had was ultimately what caused its death – their high manufacture and repair cost. By 1874 the writing was on the wall for the Penfold and new designs and manufacturers were being sought. In 1879 the Penfolds were replaced with the first version of the cylindrical box that is so familiar today albeit without 'Post Office' or a royal cypher on it again.